Tucked away off of I-75 South, just north of Macon, you can wind your way to High Falls State Park. The Falls are part of the Towaliga River and have a great sound as the river cascades over the rocks. Not a typical vertical waterfall, but quite lovely nonetheless. The river is known as a good fishing destination, but the river also offers hikers and photographers good spots to view the falls with just a short climb down the riverside staricase. The campground is across the river from the falls access. About thirty minutes outside of Macon, there are many things to do in the area. We followed I-75 north from Macon and picked up High Falls Road off exit 198. Take High Falls Road east to the Park. The Visitors Center is on the Left before the falls, and the Yurt and cabins are on the left after the falls. 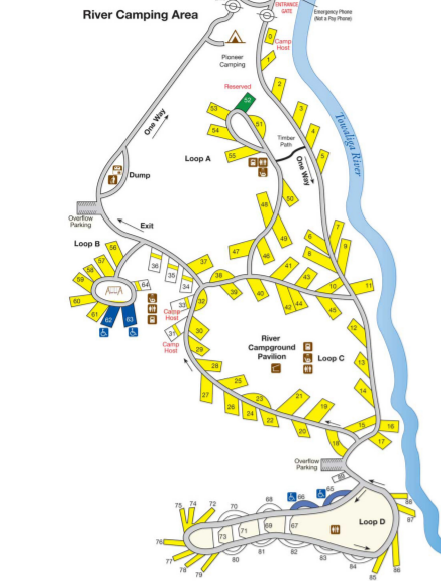 RV campgrounds entrance is up the road, so you will need to check in at the Visitors Center to get directions. Just a bit further down the road, taking High Falls Road to Mt. Vernon Church Road and then 42 northeast, you will find another Georgia gem, Indian Springs State Park. So if one is full, check the other. Both have good facilities and are well maintained. High Falls is a relaxing stop close enough to interstate I-75 to make it a good overnight site. The Towaliga River tumbles over the falls creating a peaceful and beautiful backdrop. There are 4.5 miles of hiking trails and the area is known for its Bass fishing, so bring your rod and reel. They also have a swimming pool open in season, as well as two boat launches. With 100 campsites and a few Yurts, High Falls offers an interesting mix of accommodations. The RV campground follows the river downstream and is primarily a flat area in the woods. It is well kept and the sites are nicely arranged. Reservations are now site specific, so you will have need to consult the site map to determine where you would prefer to camp. That said, most are pretty good with either wooded or river views.